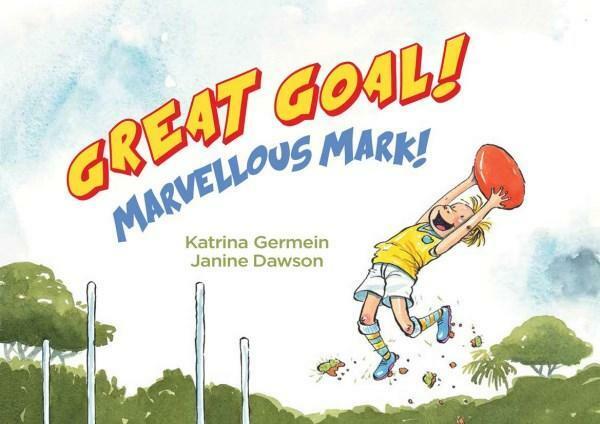 Kids' Book Review: Review: Great Goal! Marvellous Mark! Review: Great Goal! Marvellous Mark! Attention footy fans! The AFL season is upon us and what better way to get little people excited about reading a book than to read one about footy! This fantastic new picture book brings fun and enthusiasm from the very first word. It is a fast-paced, exciting read that uses all the coolest footy terminology and will have the kids hooked! Not only do the kids experience every step of game day, from the warm up and coin toss, to the final siren and celebration, but the book also manages to do it alphabetically. then drop punts to Darcy. The kids were right there in the game, passing and launching, racing left and right, then ‘Sam takes a specky! What a screamer!’ and everyone’s jumping up and down! Then the ball goes ‘up, up, up… Unbelievable Goal!’ The kids go wild! They are in the moment, living the footy dream. The alphabetic structure is done so well that the text flows seamlessly. The great thing about that is that you can easily read it to older kids without them thinking it’s an alphabet book, yet for those in that all important learning to read stage, you can guide them in letter recognition as you read together. Dawson's illustrations are fun and expressive. The excitement on the kids’ faces is genuine as they delight in playing the game with their friends. I love the way the rain increases on each page, until they are all squelching in mud and having a blast. The book also conveys a great message about teamwork. There are boys and girls of all shapes and sizes playing together, passing to each other and celebrating together. Germein has created a wonderfully entertaining book that cleverly weaves in footy terminology, game process, team spirit, alphabet recognition and pure fun, all in a high action, exciting read that your little footy fans are guaranteed to love! So, if you have a little footy fan at home, I suggest go and find a copy of this book, put on your best commentating voice, and get into the footy spirit with the kids! Title: Great Goal! Marvellous Mark!